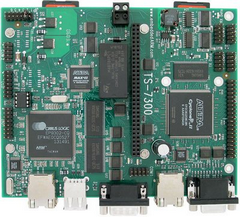 The TS-7300 is a compact Single Board Computer based upon the Cirrus EP9302 ARM9 CPU and set of on-board peripherals. The board is equipped with a SD-card which contains the OS. The TS-7300 CUSTOM target provides up to 5xPWM outputs and 5xEncoder inputs by using an alternative FPGA configuration for the DIO2 connector. •The CUSTOM FPGA DIO2 provides more digital input & output than the default configuration. •The TS_9700 peripheral board provides ADC and DAC ports for data acquisition in analog applications. •The TS-ADC16 peripheral board provides ADC and DAC ports for data acquisition in analog applications. The TS-7300 is a product of Technologic Systems. More information can be found on the website: http://www.embeddedarm.com/products/board-detail.php?product=TS-7300. •RTAI real-time Linux including the 20-sim 4C target support software. You can also order the SD Flash card with our RTAI real-time linux installation including the 20-sim 4C target support software separately from Controllab Products B.V.